For the Healing Walk, I've been warned that I should wear a gas mask if it's a hot day, when air pollution is at its worst. I've been told that my heart will break to see proud communities march through what is left of their traditional land and hunting grounds. I've been told it will forever change the way I see the tar sands, and the people who face them every second of every day. 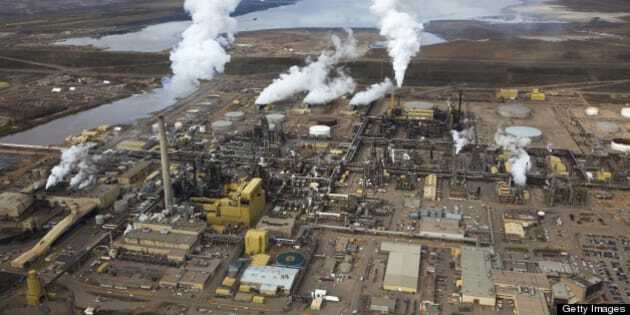 A large oil refinery along the Athabasca River in Alberta's Oilsands. Fort McMurray, Alberta. First Nations are on the front lines of the devastating impacts of the tar sands. They breathe the smoggy air, and drink the polluted water. And in July, I'll join hundreds of people in a Healing Walk to symbolize our need to heal people and our shared planet. I've worked on climate and energy in Canada for over four years. I've read the reports about the tar sands, and even written a couple myself on how the tar sands undermine climate action in Canada. But I've never seen the tar sands firsthand. That will change in about a month. On July 5th and 6th, I will travel to northern Alberta to show our support and respect for the First Nations who have lived, and continue to live on the front lines of one of the largest industrial projects on earth, a project that I spend most of my workday saying should not be allowed to continue to grow, and that we should be phasing out in favour of a clean, safe and renewable energy future that Canadians deserve. The 4th Annual Healing Walk is hosted by Cree and Dene First Nations and Metis whose traditional territory around Fort McMurray, AB has been permanently and irreversibly damaged by the tar sands. Water has been poisoned by leaking toxic waste, animals have become scarce from illness and fragmented habitat, the 'safe' limits of air pollution are frequently exceeded, and provincial health studies have shown significantly higher rates of rare cancers in local residents. For the Healing Walk, I've been warned that I should wear a gas mask if it's a hot day, when air pollution is at its worst. There are serious debates about whether children and people with health conditions should participate. (Several children became ill after participating last year.) I've been told that my heart will break to see proud communities march through what is left of their traditional land and hunting grounds. I've been told it will forever change the way I see the tar sands, and the people who face them every second of every day. The Healing Walk is about inspiration and ceremony. It's about the strength of communities, the strength of solidarity and prayer for the healing of the Earth. If we fight the reckless expansion of the tar sands together, there is no doubt that we will win. The stakes are too high not to. This will be a chance for our growing movement to get up close and personal with what we are up against, what government and industry are desperately trying to greenwash with multi-million dollar PR campaigns. More importantly the Healing Walk will showcase the incredible momentum that is growing to end the out of control growth of Canada's fastest growing source of greenhouse gas pollution -- led by those who live with the impacts every day. Last week we offered Canadians and the world a Reality Check. Now, we invite you to take a step closer to understand what the tar sands mean for those who live and breathe them. Whether you can join us in Alberta, or follow from home, visit the Healing Walk website for details. And don't forget to check out TarSandsRealityCheck.com for the truth about the tar sands. Stay tuned on July 5th and 6th for photos and live tweeting from the Healing Walk. About ENVIRONMENTAL DEFENCE: Environmental Defence is Canada's most effective environmental action organization. We challenge, and inspire change in government, business and people to ensure a greener, healthier and prosperous life for all.